[Video] Birthright group visits (Jewish Settlement of) Hebron?! 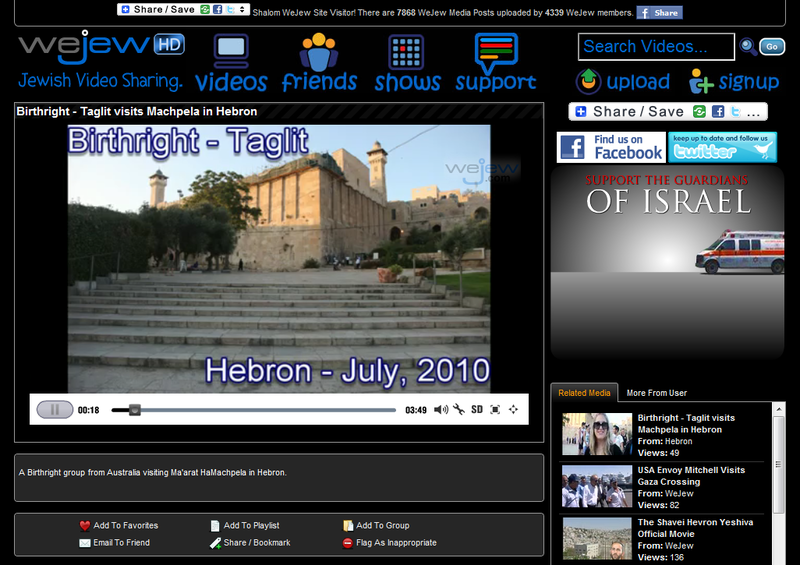 The “Hebron” account at WeJew.com (a kind of Jewish YouTube wannabe) has just (July 5 2010) uploaded a video purportedly documenting a visit this month of an Australian Birthright group to the Cave of the Patriarchs in Hebron. This site is the stated raison d’être of the extremist Jewish Settlement in the the West Bank city and its cultural center. Watch the video (if it’s been taken down, I’ve embedded a recording of the video playing on WeJew at the bottom of this post): At 01:46, “Daniel”, the apparent trip leader, is interviewed. He seems to know exactly what he’s doing. Our tours do not travel to or through areas of the West Bank, Gaza or East Jerusalem, other than the Jewish Quarter of the Old City. So what am I doing behind this Birthright table, trying to rally Jews and only Jews to go to Israel with a program whose agenda is to make them rabid, unquestioning supporters of its actions? “The conflict bubbles up,” said Barry Chazan, a professor emeritus of education at Hebrew University and education director for Birthright Israel. The problematic nature of the topics is underscored by the background of two of the four speakers who will be interpreting them: Rabbi Dov Lior and Professor Nachum Rakover. There is no term in the Halacha that states one must consider innocents during war. Of course we must stop terrorists from shooting, even if the only way to do so includes harming civilians. And has called on IDF soldiers to refuse to evacuate settlements, since such an act is “illegal according to the laws of the Torah.” There have been a number of cases in which he was responsible for soldiers’ refusal (Hebrew) to follow orders. was full of love for fellow human beings. He dedicated himself to helping others. Our right to the ‘Land of Israel’ is a very important precept, according to the Torah. There is a Hebrew idiom – the law of the land is the law – but there are laws between man and God which cannot be changed. This applies to giving up land because the settlement of Jews in the ‘Land of Israel’ is one of the most important precepts of the Torah. The Torah was given for the purpose that Jews will preserve the Torah in the ‘Land of Israel’ in its entirety. 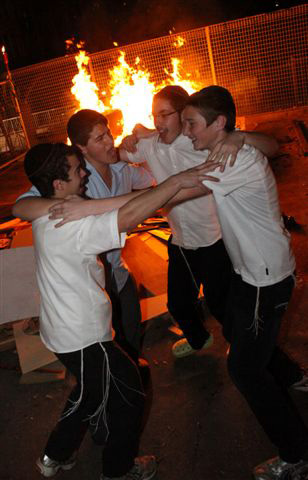 Lag B’Omer is a secondary Jewish holiday dating to Talmudic times whose origins are obscure. In Israel, one of its most widespread manifestations is the lighting of bonfires on the holiday eve, which this year (2010) occurs on Saturday, May 1. Some celebrate by burning symbols of enemies in the bonfires. When I was a child, notebooks from the classes of particularly hated teachers served that purpose. In recent years, right-wing groups have organized to encourage the burning of photos and effigies of national enemies. Today the enemy of Israel, even though he does not pretend to be an enemy of Israel, is Barack Hussein Obama. Just like you said that you used to burn pictures of Israel’s enemies. That is how I remember that I too used to burn pictures of Arafat, Sheikh Yassin, Hussein. Today our enemy is Obama. It will be interesting to see whether the Anti-Defamation League will weigh-in on this new development. Rino Tzror: Hello to Guy Varon, our correspondent in the territories. So they started to distribute effigies and pictures of Obama? Guy Varon: After we have seen right-wing activists burning pictures of Saddam, Nasrallah and Arafat in recent years on Lag B’Omer, this year there is a new star, US Pres. Barack Obama. Rino Tzror: Did you see an effigy of Obama?Guy Varon: We saw the effigies and the pictures. I also want to add that we say Barack Obama. These right wing people really like to say Hussein Obama. Guy Varon: Pictures and effigies of the superpower leader will be distributed this year ahead of Lag B’Omer by rightwing activists. They explained that as far as they are concerned he is an enemy of Israel. His behavior harms Israel more than anything. For them the message is that Obama is bad for the Jews. Rino Tzror: And they’re going to burn him on bonfires, like they used to burn pictures of Hitler, of all kinds of enemies of Israel. Is that the way Obama is going to be treated this Lag B’Omer? Guy Varon: That is definitely the intention of the people who are giving out the pictures and the effigies. Rino Tzror: Stay with us. Now we are going to talk to Bentzy Gopstein. Good morning. Bentzy Gopstein: Good morning Rino. 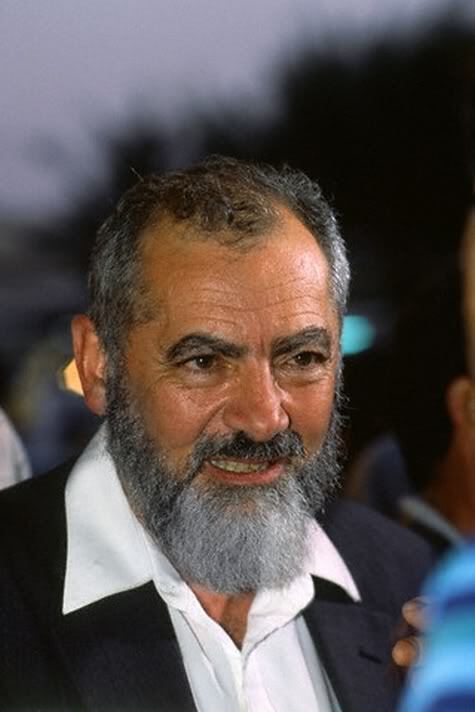 Rino Tzror: You are a follower of Kahane, right? Rino Tzror: Who started this project of Obama effigies? Bentzy Gopstein: There are a few friends together. They decided that today the enemy of Israel, even though he does not pretend to be an enemy of Israel, is Barack Hussein Obama. Just like you said that you used to burn pictures of Israel’s enemies. That is how I remember that I too used to burn pictures of Arafat, Sheikh Yassin, Hussein. Today our enemy is Obama. Rino Tzror: No, I never burned Hussein. We used to burn Hitler. We used to go for the real villains, not the ones who maybe were and maybe weren’t. 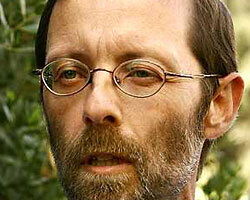 Moshe Feiglin heads “Manhighut Yehudit — The Jewish Leadership Movement” an extremist theocon group, which in recent years has established a strong presence in the Likud. Feiglin-endorsed candidates performed strongly in the 2008 Likud primaries and make up a large part of the party’s current Knesset caucus. Vice Premier and Strategic Affairs Minister Moshe (Bugi) Yaalon famously used the podium at a Manhigut Yehudit conference to call Peace Now “a virus”. One is that the armies of Czechoslovakia and France, which were much stronger before the war than the German army, went down before it like dominoes, because their leaderships failed to understand the nature of the conflict and based itself on peace processes. The second lesson, which pertains directly to us as Jews, is that before physical destruction there is spiritual destruction. Before we are murdered, our dignity is murdered, and we are rendered illegitimate. Der Stuermer always precedes Auschwitz. When you agree to be humiliated, you have not forestalled your end, you have brought it closer. Jewish history is being written today in the State of Israel. The desire to destroy the state is the same desire to destroy the Jews — to fight against the good. When the state’s leadership lets Biden or Erdogan or any other diseased leper humiliate us, it sows the hope and uncontrollable desire of destroying us. When Ahmadinejad started to talk about Israel’s destruction — it should have been clear that from Israel’s standpoint, he had lost his right to take a breath of air in this world. Since we did not eliminate him, he has been gaining strength, he and his ministers roam freely around the world, whereas Israel has become a pirate ship that has lost the legitimacy for its existence and its ministers are wanted for arrest in European capitals. We have returned to the days of the “Jewish question,” we are no longer in 2010, we are in nineteen thirty-something. Whoever warns against a preemptive strike in Iran and prefers to let the world do its work, is behaving just like the Jewish community leaders who sharply attacked anyone who tried to go against the current of the German annihilation machine. It is clear that resistance had a heavy price. But the price of appeasement and cooperation was a thousand times more terrible. Readers abroad who are amazed that the mainstream Israel media provides a platform for this kind of messaging should take a look at this ad, which ran on the front-page of the Jerusalem Post on April 7 2010. I am very ashamed of the Holocaust. How my people were taken, stripped, humiliated, tortured and led—before the eyes of the joyous Poles, Ukrainians, French and other offspring of Christian enlightenment, how newborn babies were impaled on pitchforks on the way to the death pits, how millions were led to the factories of death, and suffocated and burned, fertilizing with our people’s ashes the fields of Poland and Europe—and all with almost no resistance. I am very proud of the Holocaust. If the German Asmodeus, the essence of absolute evil in the sharpest and clearest manner ever revealed in history, if it sees me, the Jew, as its ultimate enemy, then that means that I am on the other end of the scale—in other words, there is something very good about my people. If it represents absolute evil, then it is very afraid of the absolute good — God — that I represent. There is no way to explain the Holocaust. I know survivors who are not on speaking terms with God. I know many who are the opposite. I have no right to go there — nor do I have either the ability or the desire to do so. But irrespective of the theological questions surrounding the Holocaust, one clear thing occurred in its wake: Jewish history stopped being written in exile and started to be written in the Land of Israel. Very soon, the Jewish people is going to become, for the first time since the First Temple period (! ), a people the majority of which live in the Holy Land. This fact constitutes a spiritual critical mass. Jewish law changes in several realms following the demographic fact that “most of its sons are on [the land].” The absolute number that we are talking about, the absolute number that we are approaching in the Land of Israel—is chilling. Six million. In the days after Passover, I though to myself that we may have become enamored with the act of walking on dry land within the sea, with the water like a wall to the right and to the left of us. I think Ephraim Kishon once wrote that with us, miracles are part of policy or something of the sort—I would be glad for someone to remind me of the exact wording. Can the US afford to ignore the JDL? 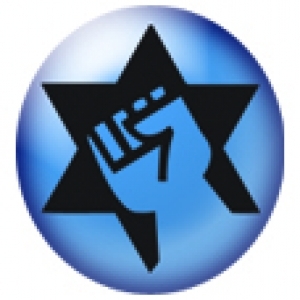 On February 14 2010, Israel Hayom published an article by Efrat Porsher suggesting that the Jewish Defense League (JDL) is reorganizing to defend Israeli speakers on campuses in the US and UK and to “prevent diplomats from enemy countries or from countries that are hostile toward Israel from speaking at university venues.” Due to the violent history of this organization — such an endeavor should worry the US as it attempts to prevent domestic terrorist attacks. Let every Jewish parent remember the tragedy of this 18 year old Jewish child and look to their own. Those who love their children- know what the Arabs would do to them! See what the Arabs did to Ziva Goldovsky and know that this is what awaits our own. And look what the Jewish Left did to an 18 year old child, and make an oath never to let it happen to our own. Mapam Youth, Hashomer HaTzair, Ratz Youth, Habonim, Dror. These are the youth groups of the Left that destroy the Jewish soul on their way to murdering the Jewish body. With such roots, it is not surprising that although — explicitly — the JDL renounces terrorism and felonious acts (along with racism), numerous arrests of their leaders and members strongly suggest otherwise.One such arrest clearly indicates their status as a terrorist organization: In December 2001, JDL Chairman Irv Rubin, 56, and member Earl Krugel, 59 were arrested for planning the bombing of the King Fahd Mosque in Los Angeles and the San Clemente office of freshman Congressional Representative Darrell Issa, R-California. The two plotters met repeatedly during October of that year to plan the attacks, and during one secretly audiotaped meeting, Krugel allegedly said that Arabs “need a wakeup call” and the JDL needed to do something to one of their “filthy” mosques. 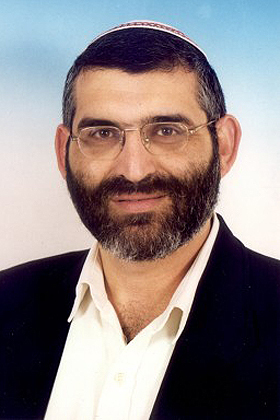 In 2002, Rubin – who had served as Chairman of the JDL since 1985 and had been arrested 40 times by his own count – committed suicide while in custody and in 2005, Krugel was sentenced to 20 years imprisonment. With such a track record, US counterterrorism authorities should be on high alert for an attempt by the JDL to become active on campuses and other public venues where their enemies may express unacceptable views. It would be extremely irresponsible and reckless for the US to ignore the possibility that JDL members will use violence or terror, as they have in the past. In Israel, Yigal Amir was publicly applauded by Kahane supporters for assassinating Prime Minister Yitzhak Rabin. Israel has paid a high price for allowing these elements to grow in influence and numbers. Hopefully, official US silence on this issue is not a sign of complacency. If it is, Americans may soon pay its price.